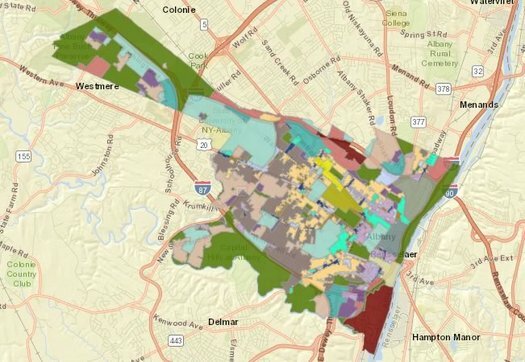 The big ReZone Albany project has reached another big milestone: a draft of the city's new zoning map. We've embedded the proposed map and the current map in large format if you'd like to compare (somewhat) side by side. Zoning might sound like a really boring topic. And it's certainly complicated. But the issues it deals with cover many things that people regularly get fired up about: How can buildings or properties be used? What sort of new buildings can be built? What should projects look like? And so on. The goal of ReZone Albany is to better match the city's zoning rules with how buildings and neighborhoods in the city are actually being used -- and to help encourage future use and development in a way that fits with the goals in the Albany 2030 comprehensive plan. If you'd really like to dive into this, here's a video of a presentation the lead consultant on the project gave to the Common Council. The presentation includes an overview of the project, but also specifics like new rules for converting single-family residences to multi-unit residences, uniform business closing times in some areas, street-level commercial use of some residential buildings, and how far new buildings should be set back from the street. The ReZone Albany project is still taking feedback from the public. And the goal is to have the project finished by the end of this year.